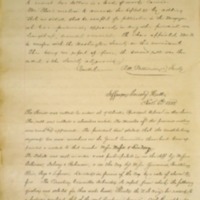 The House was called to order at 7 o’clock, President Wilson in the chair.—The roll was called & absentees noted—The minutes of the previous meeting were read and approved—The president then stated that the constitution required two more members on the Joint Committee than had been appointed & added to that number Messrs. Massie & Lindsay—The Debate was next in order & was participated in on the Aff. by Messrs Patterson, Dabney & Robinson, & on the Neg. by Messrs. Youmans, Pendleton, Blair, Page & Lefevre—Decided in favour of the Neg. by a vote of eleven to four. The Question Committee submitted its report, from which the following question was selected for three weeks hence: “Should the U. S. Navy be raised to a footing similar to that of the great European powers?” Debaters appointed on the Aff. : Messrs. Patterson.—on the Neg. Messrs. Pendleton.Blair. The report of Committee on Hall was submitted & discussed—It was decided to postpone laying carpeting & roofing the hall, but to accept the bid for repairing chandelier. The treasurer’s report was read & excuses were heard. Mr. Page introduced the following resolution wh. was tabled. “Resolved, that the initiation fee from beginning of session up to & including the first meeting in December be five dollars. The Vice President’s report was read, the second roll called & the society pronounced adjourned. University of Virginia. Jefferson Society, “Jefferson Literary and Debating Society Minute Book,” 1880 November 6, WWP17261, Jefferson Literary and Debating Society Records, Woodrow Wilson Presidential Library & Museum, Staunton, Virginia.